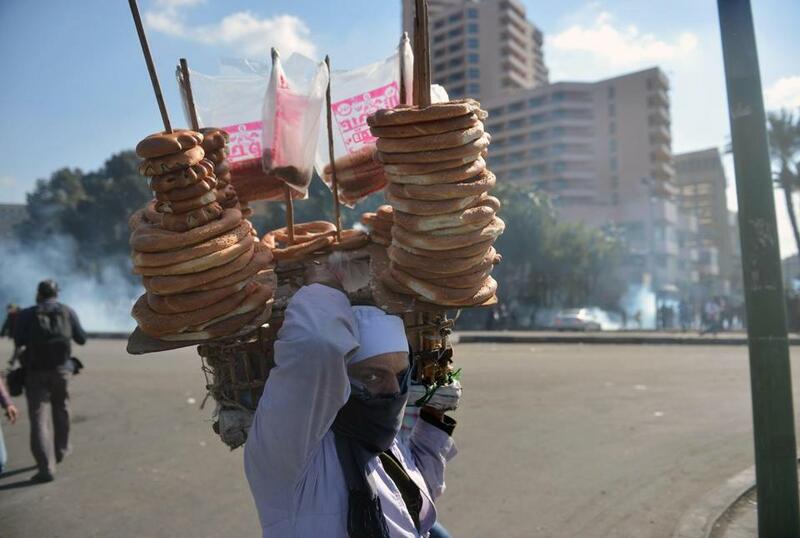 An Egyptian street vender selling bread walked past clashes near Cairo’s Tahrir Square in 2013, as riot police fired a tear gas canister at protesters. The Arab world can’t feed itself, and that’s how the region’s dictators like it. Early in the Tahrir Square revolution, a group of retired Egyptian generals sat poolside at Cairo’s Gezira Club and worried about whether the country’s ruling elite could survive a popular uprising. It was February 2011, a week before President Hosni Mubarak was toppled. Millions of freshly politicized Egyptians had already taken to the streets. And yet, some of these career security men were unfazed. As it turned out, it took less than four years for Egypt’s dictatorship to reconstitute itself, crushing the hope for real change among the people. In no small part, the regime’s resilience was due to its firm grasp of bread politics. The ruler who controls the main staples of life — bread and fuel — often controls everything else, too. Nonetheless, the specter of a “revolution of the hungry” still worries authoritarian rulers today, in Egypt and throughout the Arab world. Roughly put, the idea is shorthand for an uprising that brings together not only the traditional cast of political and religious dissidents but also pits a far greater number of poor, uneducated, and apolitical citizens against the state. Look across the region, and regimes have good reason to be afraid. Even in countries where obesity is widespread, people suffer from low-quality medical care and malnutrition due to a lack of healthy food. The basic equation is stark: The Arab world cannot feed itself. Rulers obsessed with security have created a twisted web of importers and bakeries whose aim is not to feed the population efficiently or nutritiously but simply to maintain the regime and stave off that much feared revolution of the hungry. Vast subsidies eat up the lion’s share of national budgets. So far, the bakeries haven’t run out of loaves in two of the region’s biggest bread battlegrounds, Egypt and Syria. But the sense of plenty is only an illusion. Food is expensive, people are poor, and repressive regimes rely on imported wheat financed through foreign aid. It’s an unsustainable and volatile cocktail. The Arab uprisings of 2010 and 2011 offered only the most recent glimpse of what it would look like if people got hit where it hurts the most: at the dinner table. In 1977, President Anwar Sadat of Egypt managed a feat that had been considered impossible when he broke with the entire Arab world and initiated a peace process with Israel, even traveling to Jerusalem to address the Knesset. The bread conundrum, on the other hand, proved much more intractable. Sadat tried in January 1977 to cancel Egypt’s expensive wheat subsidy at the urging of the World Bank and International Monetary Fund. Riots swept nearly every major city, and in two days Sadat caved. He restored the bread subsidy that has remained in place ever since, and the Egyptian military took control of many crucial bakeries to ensure that the government could control the bread supply in a crisis. That awkward status quo prevails to this day. The government’s bread economy is inefficient, unstable, and nearly entirely dependent on foreign imports. But any attempt to tinker with bread prices or subsidies still terrifies the country’s rulers and enrages its citizens. Regimes took heed. Hafez al-Assad, the dictator of Syria, extolled peasants in his rhetoric and made food independence a central pillar of his regime. For decades, Syrian officials constantly bragged they didn’t need to import wheat. Dictators in the Arab world learned that one of the best routes to dominance runs through the bakery. Rulers the world round usually deploy some variant of pocketbook politics, rewarding their loyalists with perks like community centers, jobs, and payola — and punishing opposition areas by scrimping on their basic services like roads and schools. In many Middle Eastern countries, the level of control was more basic: Without the government, citizens would starve. The brittle, undemocratic regimes had, however, no mechanism of oversight and little resilience to withstand outside shocks. So distant events like a bad crop on the Black Sea or low rainfall in Canada could quickly translate into a political crisis in the Levant or North Africa. In 2008, world food prices spiked, and, once again, bread riots broke out across the Middle East. Regimes scrambled to cover the shortfall with handouts and subsidies, on the assumption that their populations might tolerate repression but not hunger. Indeed, rising commodity prices were one of the triggers in the 2010 to 2011 uprisings. Protesters in Tunisia brandished baguettes. In Egypt, many of the revolutionary chants talked about food, and a central demand was for “bread, freedom, social justice” (it rhymes in Arabic). The first Syrians to rise up against Bashar Assad included many poor farmers who had been displaced by drought and the government’s neoliberal disinvestment from agriculture. Caitlin Werrell and Francesco Femia at the Center for Climate and Security in Washington, D.C., argue that a series of droughts in Syria from 2006 to 2010 created the preconditions for the uprisings — crop failures drove farmers off their land and raised the level of desperation until Syrians directly challenged their ruler. Saudi Arabia’s ultrarich monarchy calculated that it could survive any challenge from political dissidents critical of the country’s lack of rights and freedoms — as long as it could keep its citizens in material comfort. The king quickly increased handouts to citizens, and after a brief rumble, Saudi Arabians sat out the regional wave of protests that swept through nearly every other Arab state. Yet the obsession with food sovereignty and security remains close to the region’s despots. Saudi Arabia has purchased land in fertile water-rich countries like Ethiopia in order to secure its food supply. The Islamic State, for its part, has made control of the food supply a basic part of its blueprint for power, starting with the bakeries and wheat warehouses, and even facilitating the international aid deliveries that have kept some parts of northern Syria from suffering the same fate as Yarmouk. The Arab states are the world’s largest net importers of grains, depending on exports from water-rich North America, Europe, and Central Asia. So it follows that bread riots will break out every time there’s a disruption in the global food supply. Anger will bubble up every time there’s a drought. Or when oil profits fall and it becomes harder to pay for grain imports. The Middle East North Africa region consumes about 44 percent of global net grain imports, according to Eckart Woertz, author of “Oil for Food: The Global Food Crisis and the Middle East”: “Self sufficiency is not an option in the region,” he said in an interview. Still, most scholars now accept the idea first proposed by the economist Amartya Sen, that food shortages and famines are usually caused by political mismanagement, not by an actual lack of food. In the Middle East, that means conditions are still ripe for a tempest. “At the end of the day, we can explain the crisis in terms of political economy: corruption, crony networks favored over rural populations. Droughts don’t cause civil war in Los Angeles,” said Woertz, who studies food and security at the Barcelona Centre for International Affairs, a think tank. And it can’t be ignored that droughts have been a fact of life in the arid Arab world as long as there has been agriculture, and bread riots on their own have yet to transform a dictatorship into a democracy. That’s because the problem is much larger: People in the Arab world have been kept poorer than they should be by corrupt repressive governments that hog national wealth for a tiny elite. Until that changes, hunger and food insecurity will remain yet another symptom of the region’s terrible governance. Thanassis Cambanis, a fellow at the Century Foundation, is the author of “Once Upon a Revolution: An Egyptian Story.” He is an Ideas columnist and blogs at thanassiscambanis.com.